The shock waves of the Tunisian and Egyptian revolutions continue to spread throughout the Arab world and beyond. For several days, it has been Libya which is at the centre of the revolutionary upheaval. Events are evolving from day to day, from hour to hour, but everything depends today on the extraordinary mobilization of the Libyan people. Hundreds of thousands of Libyans have risen up to attack the dictatorship of Gaddafi, often with their bare hands. Whole cities and regions have fallen into to the hands of the insurgent people. The answer of the dictatorship has been ruthless: pitiless repression, massacres, bombardment of populations with heavy arms and air strikes. Today, it is a fight to the death between the people and the dictatorship. One of the characteristics of the Libyan revolution, compared to the Tunisian and Egyptian revolutions, is the splintering of the police and military apparatuses. There are confrontations within the army itself, a territorial division, with confrontation between regions and cities controlled by the insurgents and the area of Tripoli based on the military force of the dictatorship. The Libyan dictatorship represents too many social and democratic injustices and, too much repression, too many attacks on elementary liberties and rights. It must be driven out. The Libyan revolution is part of a whole process which covers the whole Arab world, and beyond, in Iran and China. The revolutionary processes in Tunisia and Egypt are radicalizing. In Tunisia, governments fall one after the other. Youth and the workers’ movement are pushing their movement still further. All the forms of continuity with the old regime are called into question. The demand for a constituent assembly, opposed to all the rescue operations of the regime, is becoming increasingly strong. In both countries, Tunisia and Egypt, the workers’ movement is reorganizing itself in the fire of a wave of strikes for the satisfaction of vital social demands. This revolutionary rise takes forms that are particular and unequal, according to the countries: violent confrontations in Yemen and Bahrain, demonstrations in Jordan, Morocco and Algeria. Iran is also once again affected by an outbreak of struggles and demonstrations against the regime of Ahmadinejad and for democracy. It is in this context that the situation in Libya takes on strategic importance. This new rise already carries within it historical changes, but its development may depend on the battle of Libya. If Gaddafi takes control of the situation again, with thousands of deaths, the process will be slowed down, contained or even blocked. If Gaddafi is overthrown, the whole movement will as a result be stimulated and amplified. For this reason, all the ruling classes, all the governments, all the reactionary regimes of the Arab world are more or less supporting the Libyan dictatorship. It is also in this context that US imperialism, the European Union and NATO are multiplying operations to try to control the process that is underway. The revolutions that are in progress weaken, over and above what the imperialists say in their speeches, the positions of the Western imperialist powers. So, as is often the case, imperialism uses the pretext of a “situation of chaos”, as it calls it, or of “humanitarian catastrophe” to prepare an intervention and to take control of the situation again. No one should be fooled about the aims of the NATO powers: they want to confiscate the revolutions in progress from the peoples of the region, and even to take advantage of the situation to occupy new positions, in particular concerning control of the oil regions. It is for this fundamental reason that it is necessary to reject any military intervention by American imperialism. It is up to the Libyan people, who have begun the job, to finish it, with the support of the peoples of the region, and all progressive forces on the international level must contribute to that by their solidarity and their support. From this point of view, we are in total disagreement with the positions adopted by Hugo Chavez, Daniel Ortéga, and Fidel Castro. Fidel Castro has denounced the risk of an intervention by American imperialism instead of supporting the struggle of the Libyan people. As for Hugo Chavez, he has reiterated his support for the dictator Gaddafi. These positions are unacceptable for the revolutionary, progressive and anti-imperialist forces of the whole world. You do not oppose imperialism by supporting dictators who massacre their people who are making a revolution. That can only reinforce imperialism. The fundamental task of the revolutionary movement on an international level is to defend these revolutions and to oppose imperialism by supporting these revolutions, not the dictators. We are on the side of the Libyan people and the Arab revolutions that are in progress. We must express our unconditional solidarity, for the civil, democratic and social rights which are emerging in this revolution. One of the priorities consists of supporting all aid to the Libyan people – medical aid coming from Egypt or Tunisia, the food aid which is needed -, demanding the cancellation of all commercial contracts with Libya and the suspension of all delivery of arms. We have to prevent the massacre of the Libyan people. Solidarity with the Arab revolutions! No imperialist intervention in Libya! The above comment confuses me because it hinges on a few facts which it doesn’t seem that anybody outside of Libya can be certain about. First, we do not know exactly what “support for the people” for a no-fly zone was like. Second, we don’t know what the most pro-worker factions of the revolution are. However, it is possible to demonstrate that there have been racist attacks against sub-Saharan African migrant workers, who make up about 15% of Libya’s working class. Yes, Gaddafi is totally opportunistic about claiming pan-Arabism or pan-Africanism, dangling the Africa medallions and all the rest. This is a diversion though. The racist policies of the US government do not excuse the Tea Party or more overtly white supremacist groups. Getting a real, and not glorified, picture of the seemingly contradictory forces in the Libyan revolution is important if we want to deal with reality. And it is possible to have a complex view of the world where one can be both critical and non-supportive of backwards elements and actions among the rebels as well as critical and non-supportive of Gaddafi. Especially since we in the US are limited to a very abstract level of “solidarity” with any forces on the ground. I know that I oppose Tomahawk missiles being lobbed at Libya. Beyond that, I have no worked out position on this. If I had more time I would like to investigate the situation of migrant workers in Libya more thoroughly. Although marketed as “anti-Gaddafi,” what is going on is a war of aggression by the imperialist countries against Libya and the Arab world. Every time the imperialists want to drag us into a war, they put out all sorts of stories about incredible atrocities and humanitarian crisis. There might be some truth to them, though often there is not (those old enough will remember the stories about Saddam’s troops throwing newborns out of incubators in Kuwait when he invaded that country two decades ago. The story wasn’t exaggerated: it was completely invented by the Washington PR firm hired by the Emir of Kuwait to get his throne back for him). But whether the atrocity stories are false or not, history teaches us that once the imperialists get involved, what may have been a humanitarian crisis becomes a humanitarian cataclysm; the blood bath becomes a blood tsunami. There’s no small irony that this war is starting exactly 8 years after the start of the Iraq War, which was proclaimed ended just six weeks later by President Bush in his famous “mission accomplished” speech but is going on to this very day, hundreds of thousands of dead later. I grieve for the people of Libya. A plague has been unleashed on them today that is worse than a thousand Gaddafis. I think the situation has become somewhat less convoluted now that France, Britain and the US have begun bombing military targets. Let’s get one thing straight, we can all see the hypocrisy of the major powers when they speak of defending civilians in Libya whilst turning a blind eye to their massacre in Bahrain. A no-fly zone for humanitarian reasons is just not in the political vocabulary of imperialism. The UK has already attempted to clandestinely influence the opposition with the attempted insertion of Special Forces and intelligence personnel. This little episode seems to have slipped from the public eye, a mistake I think considering its implications. Hypothetically (or not so now that live rounds are being used) it is not absurd to suggest that imperialism may be pinning its hopes on a friendly client administration appearing out of the opposition, since it appears to be led by notably high ranking former members of the Gadaffi government that are welcoming of intervention. The rank and file, however, as is to be expected, tend to be more cautious of western influence and simply seem to want to get hold of foreign weaponry. This is the point, the British did not simply call the rebels and ask to send a few diplomats over, nor did the directly address the now revolutionary masses. They deliberately attempted to insert people into the oppositions political and military structures, no doubt for reasons stated above. I would be a liar if I said I was not initially relived to hear of the no-fly zone and cease fire. In the immediacy of the event, I wanted the rebels to stop being slaughtered, but now that the west is showing its hand I think it would be just naïve to take any stance other than that of resolute opposition to intervention. Now, hold on. 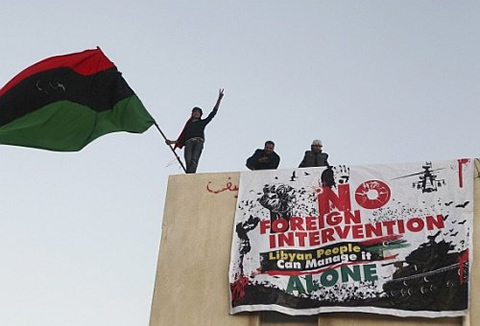 The Libyan National Transitional Council called for a no-fly zone, with great support from the people. Gadaffi’s forces were on the doorstep of Benghazi yesterday, promising to show no mercy. Now, with scarcely a single sortie run by the UN forces, they’ve called a ceasefire! If that’s what the result of an opposition-sanctioned no fly zone (NOT an invasion- there are not and there will be no boots on the ground, and the UN resolution does not call for targeting of anyone on the ground unless it becomes necessary to protect civilians, not opposition fighters), then I see no problem with it. As for racism in the revolution, mentioned by the above apologist, how about looking at Gadaffi? Ever heard of the Islamic Legion? Look it up. Now, obviously the US is being hypocritical. Obviously, they are supporting other human rights abusers while denouncing this one. Obviously, they are politically motivated. But, does that mean that intervention- intervention not by the US, but by the UN- is wrong? Would intervention have been wrong in Rwanda? Just because the US doesn’t take action when it needs to, doesn’t mean that it should never take action, when action is warranted. Should we be wary of US imperialism? Hell yes! We need to keep an eye on what the west is doing, and not let them hijack the revolution. We need to show solidarity with (and not alienate by supporting the dictator, as Chavez has done) the most pro-worker factions of this revolution (and let’s face it, no matter how you slice it, Gadaffi’s so-called socialist government is NOT pro-worker). We need to demand that the autonomy and democracy of the revolution is respected. With talks going on, the best way I can see this ending is an open, democratic constitutional convention and free elections. What and who, exactly, are we supposed to support? Unfortunately, this question has been overlooked by many leftists so far. We’ve been all too eager to see Libya as another Tunisia or Egypt, when the reality on the ground may be very different. First, we need to look at the class composition of the two sides. As far as their leadership is concerned, we have neo-liberal elites who are loyal to the old guard, and neo-liberal elites who have defected or are in exile. This should be very worrying, because unless the non-elites can avoid being co-opted, they stand to lose no matter whether Gaddafi loyalists or the “rebel” leaders win. Second, and related to the issue of class, is the question of race-ethnicity. In Libya, one group that is apparently still loyal to Gaddafi are black Libyans, who make up some if not all of the so-called foreign mercenaries. This group has long been economically marginalized, doing the jobs that Arab Libyans did not want to do. At the same time, though, many of them felt (and were) safer with Gaddafi in charge. Worst of all, as Glen Ford puts it, the “relatively prosperous Libyans” now seem to be engaged in a “vicious, racist pogrom” against their fellow black Libyans. Third, even with the above complications in mind, leftists should of course embrace the end of Gaddafi’s rule. At the same time, too, we must also oppose self-interested elites in the West (and Middle East) who aim to exploit the revolt in Libya. Still, we cannot take for granted that what is going on there is a genuine people’s revolution of the sort we saw in Tunisia and Egypt. The classist and racist nature of events so far should make us think twice about giving our unqualified support to those who are producing them.